With the summer in full swing, parents are looking for ways to engage their kids in healthy activities. 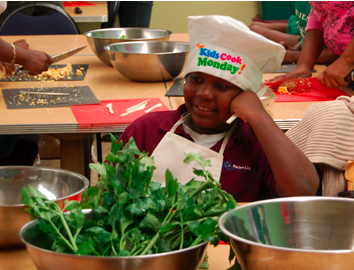 Here are some tips from Kids Cook Monday on how to get kids excited about spending time in the kitchen, and teach them healthy habits in the process! Before stepping foot in the kitchen, get your hands dirty and grow food together! Engaging children in gardening is an excellent way to connect them with the natural environment, help them develop an appreciation for where their food comes from, and increase their fruit and vegetable consumption (because most kids will, in fact, eat food that they had a hand in growing!). Involve kids in meal planning. Allow your child to participate in the process by suggesting a food that he or she would like to cook, or let them choose from several healthy menu ideas that you suggest. Try designing a fun-themed dinner and discuss ways to make it healthy with a variety of colors and textures. Make it a total experience by shopping for ingredients together, too. Bring a list of ingredients with you to the market and allow your child to help you find everything you need. Use this as an opportunity to show children how to read labels and choose the healthiest options. You can even let kids pick a new fruit or vegetable to try as a family adventure! Let’s move to the dinner table. Maggie LaBarbera, founder of kid’s nutrition site Nourish Interactive, serves up three pointers to make meal time inviting. Start each week with a family dinner night! When the whole family pitches in during mealtime, kids are more likely to eat the finished product. Use this cooking time to teach your child about nutrition and serving sizes. Gather round the table. On family dinner night, eat around a table and let family be the focus by turning off the TV, cell phones and iPods. Use dinners as an opportunity to check in, catch up and share thoughts with each other. Don’t give up! Studies have shown that many kids won’t try a new food until it’s been offered several times, so keep trying. Don’t become upset if your child rejects a new food; after a few attempts it may seem more familiar. Encourage your child to try at least two bites of anything new, and be sure to applaud adventurous eating. For more tips and resources, visit www.kidscookmonday.org where you’ll find weekly recipes for different age groups. Photo provided by Kids Cook Monday.